May was a difficult month for the Phillies, who finished with their first losing May since 2002. The month featured a four game home and home sweep at the hand of the Blue Jays, the return of Mike Trout, several final inning wins and losses, and a no-hitter by AJ Burnett. A slightly promising .500 record to begin the month evaporated and the Phillies dropped to 5 games under .500 at the conclusion. AJ Burnett allowed 8 earned runs in six innings last night and the Phillies uncoincidentally fell to 9 games below .500. Burnett has pitched miserably for over a month to the tune of a 7.25 ERA since his last decent start on May 3. He has allowed at least 4 earned runs in his last three starts and four of his last six. The Phillies lost 4 of those six games. His ERA after finishing a one-run effort against the Nationals on May 3 was 2.06. Now his ERA is 4.52. Oftentimes you can determine deficiency areas in a Major League Baseball organizations from their selections in the MLB Draft. Through the first two rounds, the Phillies showed they need pitching and they need it quick. The Phillies changed their draft strategy this time around, selecting the more proven commodity over the raw, high ceiling picks over the last few years. The Phillies used their seventh selection this year on Aaron Nola, a pitcher who many insiders project to be pitching in the majors sooner than anyone. Clearly Marti Wolever wanted a pitcher on a fast track with their first pick, but he disguised his true intentions. He said Nola's fastball command, not a quick ascension to the majors, was the primary reason the Phillies took the 195-pound righthander as the seventh overall selection. "It truly wasn't a factor, although I think it's going to turn out fairly well," Wolever said. "We would hope that in a couple of years he could be here pitching on the major-league team." This is old news at this point, but I wanted to revisit the comments of Larry Bowa from last week because it offers a good discussion. Bowa made headlines last week with his interview on 97.5 the Fanatic in which he expressed his frustrations with the last place Phils. Before exploring the real meat of the interview, let's begin with the comments that garnered the most attention, applied towards Domonic Brown. "He comes to the park upbeat every day. I don't know how he does that because if it were me, I'd be going nuts right now," Bowa said. I take a little exception to how many of the media outlets construed his comments as a shot at Brown’s makeup, which insinuates that Brown doesn’t really care about winning or losing. In many ways, Brown’s upbeat attitude might be one of his best qualities. Brown mentions having fun during nearly every interview, which feels more like a defense mechanism and his only way of coping with a miserable 2014 campaign. Bowa did, however, call out Brown for his offensive performance. "The big thing to be concerned about, there was a five-week period- or-six last year and if you take that away, [Brown's] numbers aren’t very good,” Bowa said. He stopped just short of calling Dobo a complete fluke, saying, “He's not playing the way he's capable of playing." Another player Bowa targeted, this time more directly, was Roberto Hernandez. "Hernandez has to go deeper than five innings," Bowa said. "This is the big leagues. This isn't double A. This isn't triple A. The pitchers have to go more than five innings. If you have a big-league uniform on, you have to go more than five innings. What happens? It trickles down." While Bowa may have subtly attacked a couple players, his rant had very little to do with the makeup of the ball club. Rather, it was a message of overall frustration with the lack of natural talent on the roster. The 2014 MLB Draft is over and the Phillies, using a starkly different approach, went hard after pitching and college players in an effort to rebuild a severely damaged farm system. Their greatest need was pitching, so the Phillies predictably used 22 of their 40 selections on pitchers. The Phillies also targeted college players, choosing them for 28 of their 40 picks. This is extremely uncommon for the Phillies. They have said it is a coincidence, but through the 25th round of the 2014 First-Year Player Draft they have selected 24 college players (96 percent). That is way above the average for the Phillies over the previous 10 drafts. College players represented 280 of 488 (57.4 percent) of Phillies draft picks over the previous 10 years. The reason for this about-face is that the Phillies want to add safer, more polished players who can contribute quickly as opposed to players with higher ceilings who require more time to develop. With prospects at the forefront of many baseball conversations, it seemed like a great time to revisit the effects of free agency and trades on the Phillies' farm system. Let’s start with the often overlooked aspect of Type A free agent signings on the draft. In Ruben Amaro's tenure, the Phillies signed three Type A free agents, which required forfeiting their first or second round picks: Raul Ibanez (2009), Cliff Lee (2011), and Jonathan Papelbon (2012). Through those signings the Phillies surrendered pick numbers 27, 33, and 31, respectively, leaving them with picks 75, 39, and 40, respectively, in those three seasons. The Phillies have obviously struggled lately, with losses in seven of their last eight games and a 5-13 record in their last 18 games. Their reward for such failure is the label of the worst team in the National League (although technically they are tied). In fact, the only team worse than the Phillies in all of baseball is the Tampa Bay Rays. That the Phillies co-own the worst record in the league and second worst in baseball is somewhat unbelievable considering the Astros lost 111 games last season, the Marlins lost 100, and the White Sox lost 99. Equally as amazing is that the Diamondbacks passed the Phils. The D-backs were 8-22 following two losses after finishing a series with the Phillies on April 28. They held a .286 winning percentage at the time and were on pace for nearly 119 losses. Since then, they have a 21-16 record. The Phillies, who had a 13-12 after facing Arizona, are 12-24 since then. The weird thing is that the Phillies are still only 7.5 games back, which puts them closer to first place than 10 teams in baseball and closer than all teams in the NL West (second place Dodgers are 3 games over .500 and 8.5 games back of the Giants). At the beginning of April the Phillies were tied for the 15th best team in baseball with a .500 record. Now the Phillies are looking up at every National League team, along with the Cubs, of course, with a .410 winning percentage. The San Diego Padres arrived at the perfect time for the Phillies, as the Fightins were able to feast off the worst offense in baseball. We’re talking really, really, bad. The Padres leave Philadelphia with the worst team average in baseball (.216), lowest OBP (.275), slugging (.344), OPS (.618), and runs (200). All of those figures are significantly worse than the next worst. Regardless of how bad the Padres are, the Phillies needed this series to cleanse some of the funk of losing eight of nine games entering the series. Despite winning 3 games in a row for the second time this season, the Phils are not fooling anybody considering they are still 8 games under .500. So how did the Phillies get in this hole? Let's look at the Phillies in the month of June prior to the San Diego series. First of all, they received no production from third base with Asche on the DL. Prior to this series, Hernandez and Brignac batted .187 with a .268 on-base percentage and .219 slugging percentage in 71 plate appearances in Asche's absence. They combined for two extra-base hits and 22 strikeouts in 18 games, although Brignac's walk-off homer yesterday and two-run double today were obviously a huge improvement. It’s the difference between Buchanan leaving after six innings with 4 runs allowed versus Lee leaving with two outs in the sixth inning with about 2.5 runs allowed. The one positive from June was that the bullpen pitched effectively, posting a 3.86 ERA which ranked 7th in the league. The Phils righted the ship with a sweep of the Padres and hopefully can continue the trend with the Cubs coming to town next. They will need all the momentum they can create with 18 straight games against winning teams (Braves twice, Marlins twice, and Cardinals) after the Cubs. His .218 average ranks #61 of 65 all qualified MLB outfielders. His .266 on-base percentage is #64 of 65. His .320 slugging percentage is #62 of 65. His .586 OPS is #64 of 65. His .102 ISO (Isolated power) is #57 of 65. His -0.9 WAR according to Fangraphs is dead last. Let's face it, if the Phillies had any other options or if Darin Ruf was healthy and producing, Domonic Brown would be the starting left fielder at Lehigh Valley. His one historic month last season only buys so much time before a demotion is in order. Looking for something to do on this Father's Day? Here are a few good articles to read. Happy Father's Day! Jimmy Rollins has been a part of our lives since 1996 when he traveled 2,745 miles from his hometown of Oakland to Martinsville, VA, where he played for the Martinsville Phillies rookie league team in the first of 19 years in the Philadelphia Phillies organization and 15 years with the big league club. 15 years, 2,234 base hits, 435 stolen bases, 207 home runs, 858 RBI’s, 1,280 runs scored, 4 gold gloves, 3 All-Star games, 1 World Championship, 2 NL Pennants, 5 NL East titles, and 29 playoff wins later, we are possibly closing in on the end of the career of Jimmy Rollins. As Jimmy Rollins prepares to break Mike Schmidt’s Phillies hits record, he has been the topic of many conversations. Whether you like him, hate him, or fall somewhere in between, most of us have our opinions on J-Roll. Today marks the 50th Father's Day since Jim Bunning's perfect game in 1964. Frank Fitzpatrick of the Inquirer wrote a great article about the perfect game which recaps the days leading to and following the first perfect game in the NL in 84 seasons at the time. On learning temps would be in the 90's for the game: "I loved the heat," he said. "I sweated a lot, and I'd go through three jerseys every game. But I welcomed it because I knew I was in better shape than the hitters." "The only game I ever got Williams out four times," Bunning said. "Four pop-ups." In his first Philadelphia season after nine in Detroit, Bunning, 32, was at his peak. He was 6-2 with an ERA under 2.50. Tellingly, on May 29, he'd been perfect for 62/3 innings against Houston before a blooper fell in front of Wes Covington. Though he'd been hit hard the previous Wednesday in Chicago, Bunning earned a rare save a day later when manager Gene Mauch used him to get the final two outs in a 6-3 win. Then there is the other side of perfect and his name is Jesse Biddle. Earlier this season I wrote that fans should get hyped up for the Phillies/Braves series in April when the Phillies were 6-6. If you pay attention more to the standings than win/loss records, you can probably follow the same advice after a win in the first game of a three game set against the NL East leading Braves. A three game sweep of the Braves would put the Phillies 3.5 games behind Atlanta. They would be 6 games under .500, but shockingly right in the mix in the NL East. Of course, teams with a significantly sub .500 records who only manage to go 4-2 against the two worst teams in the league don’t often create good stories down the stretch. 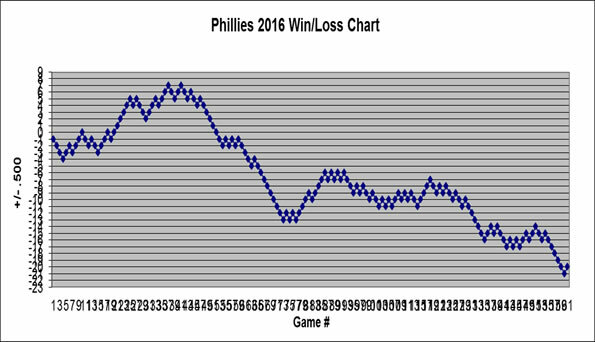 Speaking of the stretch, yesterday began an extremely difficult one for the Phils with 32 of their next 35 games against winning teams. The one non-winning team: the Pirates who are 34-35. It is baseball in St. Louis for the red hot Philadelphia Phillies (did I really just write that?) as they take on the Cardinals. This has always been a series to circle on the calendar in many Philadelphia households ever since the Cardinals came from 6.5 games behind with 12 to play to steal the NL Pennant from the Phils in 1964. For those of us not old enough to endure the greatest collapse in Major League history, the 2011 NLDS should offer enough motivation. Ignoring epic meltdowns and postseason defeats, the Phillies face the Cardinals at an interesting time. The Phillies come in as winners in seven of their last nine games and attempt to win their fourth straight for the first time this season. Then again, the Cards are even hotter with eight wins in their last ten and a 5-1 record in their current homestand. The Phillies have their work cut out for them against a Cardinals team with the third best record in the league at 39-33. The Phils actually rank ahead of the Cardinals offensively with 280 runs scored (9th in NL) compared to 270 for the Cards (11th). But the Cardinals' 3.18 team ERA ranks 2nd in the NL, while the Phillies' 3.94 ERA is 13th. 10 days ago the Phillies were not in a happy place. Losers of eight of their last nine games against jugger-nots (like the word play?) like the Mets and Reds, the Phillies were in dead last in the division and 11 games below .500. They were tied for the worst record in the NL and second worst in baseball. We had finally arrived at the official end of the greatest era in Phillies history. Since then, the Phillies have gone 8-2 in their last 10 games and on paper are legitimately in the hunt in the NL East at just 4 games out of first. How did they do it? They hit well, pitched well, and fielded well. Funny how when those things come together, teams tend to win ball games. Let's jump inside the numbers over the last ten games, shall we? Poll results: How much are you watching Phillies compared to last year? Sounds about right. Comcast certainly did not help things by firing Wheels and Sarge and replacing them with Jamie Moyer and Matt Stairs. Moyer has actually has improved, but the broadcasts with Matt Stairs, who follows the mantra of don't speak unless spoken to, are difficult to watch. Thanks as always Comcast! Of course, if the Phillies continue winning as they have, these percentages will shift dramatically. The Phillies scored 4.8 runs per game during their 9-2 winning stretch, the starters had a 2.35 ERA, and the bullpen had a 1.95 ERA. One stat that should not be overlooked is that the Phillies committed just two errors in those 11 games. In this game, poor defense in the eighth inning contributed to a 4-1 loss and the end of the Phillies' five-game winning streak. The Cardinals took a 2-1 lead in the eighth when Hamels allowed a walk to begin the inning and Matt Holliday followed with an RBI double. It was a questionable decision to allow Hamels to start the inning with 107 pitches entering the frame. The Phillies lost the opener to the Braves Friday night, but Phils' broadcaster Tom McCarthy caught Freddie Freeman's three run blast. Better yet, with a little encouragement from his friends, Tom threw the ball back. Here's the awesome video. Cool as could be, T-Mac called the play, put on his glove, and then made the catch with no fear. As Harry Kalas would have said, "Tom McCarthy, you are the man!" If there is one thing above all else that made Charlie Manuel the winningest manager in Phillies history, it was that he knew how to manage people. He knew which players needed to be coddled, which needed a swift kick in the $#@, and which needed the manager to just stay away. Whatever the methods, they worked quite well for Charlie Manuel. Ryne Sandberg does not seem to have that touch quite yet.